Hey, lots of good news on the anthology front while I was traipsing around France and Switzerland these past couple of weeks. 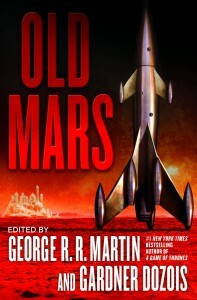 You can check out the details at http://www.locusmag.com/News/2014/06/2014-locus-awards-winners-2/ And congratulations to my pals Daniel Abraham and Ty Franck as well. As James S.A. Corey, they won the Locus Award for Best SF Novel of the year. (Would that ABADDON'S GATE was on the Hugo ballot as well). And of course, congrats to my co-editor Gardner Dozois, and our amazing lineup of writers, who made the anthology the delight that it is. If you haven't checked out OLD MARS yet, you missed at lot. ((And for what it's worth, OLD VENUS will be even better)). Next thing, the nominees for this year's World Fantasy Award were announced. 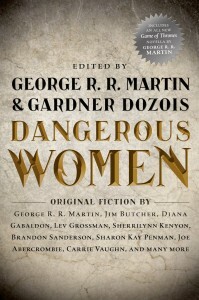 OLD MARS wasn't eligible, being science fiction and all... but DANGEROUS WOMEN, the big crossgenre anthology that Gardner and I released last summer, is one of the finalists for Best Anthology (against some mighty stiff competition, I might add). 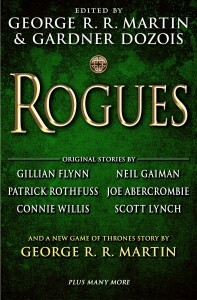 To round out the triptych, in the midst of all this recognition for the books that Gargy and I did last year, our newest anthology, ROGUES, hit the shelves from coast and coast... and debuted at #7 on the NEW YORK TIMES Bestseller List. No, not the anthology bestseller list, or the SF/ fantasy bestseller list, but the bestseller list for ALL HARDCOVER FICTION. Which is pretty damned extraordinary for an anthology. So, all in all, it was a hell of a month. My thanks to the LOCUS voters, the World Fantasy Con members and judges, and all the readers who snatched up ROGUES. I love doing anthologies, and introducing great stories and new writers to my fans. It's great to see the books being so well received. Haven't tried the others yet, but loved loved loved "Rogues". The Rothfuss story was clever - loved all the hidden subtle plotting happening, and Bast's two-way relationship to Emberlee - and loved Lynch's story, too. Always nice to see more women represented. Flynn, of course, is always a master. I discovered new authors, too. That's the best thing about anthologies. Congrats on the Good News! I'm working on both Dangerous Women and Rogues at the moment, both have been great so thank you to you and all the other authors/editors. On a side note, you have got to be dreading NFL season, your teams are looking rough hahaha. Only 49 days until the pain begins! Now I realize that this ties into the whole "Third person POV" thing that the main novels use: no one really knows objectively what happened, and as in real history, we have rival reports. But the question is...do *you* know, and it's just a secret you're taking to your grave? Or is there, objectively, no answer? What really pissed me off about Battlestar Galactica's later seasons is when Ron Moore - a writer I used to deeply respect - eventually had to admit that he was making up the entire thing as he went along: there was never a "Cylon Plan". It was in the opening credits, at EVERY convention panel people would ask "is there a Cylon Plan?" and he's say "of course there is"...though his hidden caveat was "of course there's a Cylon Plan...I just haven't come up with what it is yet!" (ultimately the man had no deep seated narrative views on "God did it", it was just a deus ex machina to slap out an "ending" of a sort while running out the studio door shouting "no backsies!" In contrast, you know who Jon Snow's mother is, and have known since the first book - objectively there is an answer, you just haven't revealed it yet. Rhaenyra is such an intriguing character because her actual personality is clouded behind so much rival propaganda and salacious gossip. I think that was sort of the point - are we dealing with the Mushroom/smallfolk/gossip version of Rhaenyra? The Greens' biased views of Rhaenyra? (She couldn't cut her legs on the Iron Throne if she was *wearing armor* at the time). So objectively, do YOU know which of the rival stories about Rhaenyra is true? Or is it an intentional unsolved mystery? Or is one of them true, but you're taking the secret to your grave? (similar to how we may never know if Bran the Builder really did built the Wall AND Winterfell AND Storm's End, or if the myths just got confused). Or other questions, like who killed Harwin Strong? Alicent? Larys? Viserys I? Or who killed Laenor Velaryon? Why did Criston Cole ultimately scorn Rhaenyra? It's in a sort of state of quantum flux at the moment. Will the proposed "Fire and Blood" anthology ever provide answers about this? By my count if you wrote 80,000 words on the Dance of the Dragons, taken together the Rogue Prince and the Princess and the Queen only give us about half of the whole material. Great stuff indeed! As a new writer, are anthologies an 'easier way in', or is it more like being invited to an elite club (without the snobbery)? I have all the anthologies that you submitted fantasy (aka, Seven Kingdoms) stories for, going as far back as Legends, and as recent as Rogues, by the way. Glad everything is going so well for you, and I'm looking forward to your latest Seven Kingdoms offering. Before I close, you said: "I love doing anthologies, and introducing great stories and new writers to my fans." Congratulations for Old Mars ! I need to pick that one up, now. So, on the other hand, The Princess and The Queen didn't make it. A little sad for Archmaester Gyldayn, who worked really hard on his writing, and thought long about every word he put on the pages, I think. But not really a surprise. It's a great piece of writing, but you need to be a harcore Seven Kingdoms fan to really understand how great it is. Peraphs Gyldayn should consider to enter a songwriting contest? I think that old rogue would be great at that. Just read your intro. So well written Maester Wordsmith. Looking forward to seeing you in Edinburgh on 11 & 12 August 2014. You'll be in Scotland just before the historical referendum on 18 September 2014, "Should Scotland be an independent country?" Obama & Clinton have said we should stay with UK. What do you think George? Should those 'beyond the Wall' which inspired your Wall, become the 'Free Folk' too? Hi! Sorry to bother you. I LOVED GOT. Is it OK if I make an android lockscreen themed with GOT? I've seen lots of apps themed with GOT but I want to know if you can give me the OK. I promise it will be beautiful and you can ask me to put it down whenever you want. Thanks in advance! If you are going to work with an anthology dealing with stories from the golden age of science fiction, is there any change that "Saurian Valedictory" by Norman L. Knight will be included? BRACKETT: I think even the most flagrant escapist fiction is not entertaining unless it makes at least an attempt to have real people in it. I mean unless you get into the emotions of the people and try to present it like something that would really happen. Like, one of the main fascinations of science fiction to me has always been the aliens. What other fields can you get into a totally alien mind, and play with all of these different worlds and social setups. One of the really great stories on alien mentality was “Saurian Valedictory” but I've forgotten who wrote it. HAMILTON: Norman something-or-other was his name. It was in Tremaine's Astounding. It was a brilliant achievement and nobody seems to have heard of it, or him. It was an attempt to depict a reptilian civilization before Man. It succeeded triumphantly; the values were all so different, the psychology. I've been trying to reprint that for years. I tried to get August Derleth to reprint it, but... I think I'm the only one who likes it. BRACKETT: No you're not. I'm the other one. Good writers, but Gardner and I do original anthologies, and leave the reprints to others. I just read The Rogue Prince and it was an incredible reading, so much so that I went back to read The Princess and the Queen, it was so tragic however it was very entertaining. I can't get enough of the Targaryens. I just read an article in the Huffington Post about the fan theory about Jon Snow's mother, it's amazing how that idea that you conceived so long ago it's now a part of pop culture. Congratulations on your work Sir. Just got the notice from the library that ROGUES is in, happy day, indeed. I remember discovering new authors and worlds in LEGENDS, and am happy to do so again and again with these anthologies. Loved Dangerous Women and Rogues but of course read DW first and then Rogues as that is how they were published. Wish Rogues with The Rogue Prince had come first as that is the story that leads up to the Princess and the Queen in Dangerous Women! Once I read Rogues I felt more invested in the characters and the dragons...and the Princess and the Queen was very painful to read a second time. Too much dragon blood.